The 2011 Yukon Quest has barely ended and already Dave has his eyes set for next year. The training schedule never really stops though there are changes. Soon it will be time for weight training, then water training in summer. The serious work begins in October when the snow flies and possible fundraisers loom at Ivory Jacks. 1. One ticket to the Start Banquet to join your musher’s table. 2. 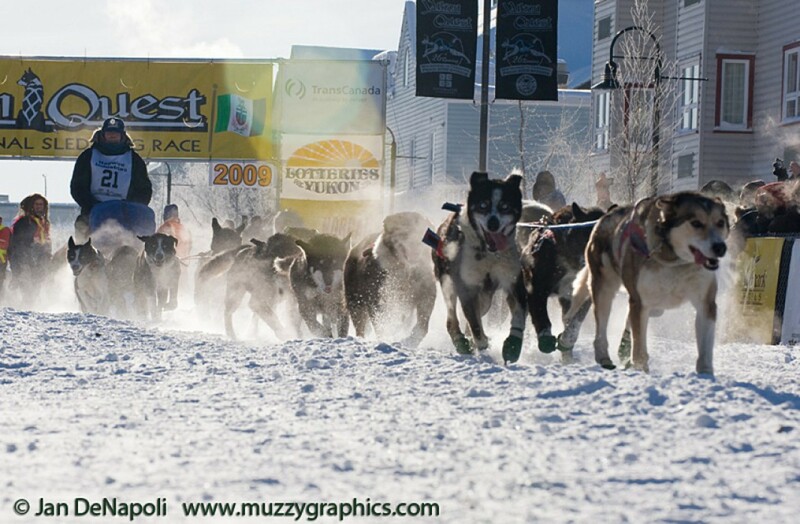 A Special-Access Pass to the pre-race staging area to watch (or help) your musher prepare. 4. An autographed poster signed by your musher. 5. A picture of you and your musher holding the sled at the Start Line. 6. Your name read by the announcer at the Official Race Start. Our thanks go out to Marcia, the winning bidder for Dave this year and the winning fan in our hearts!!! The Dalton Gang made their entrance into Fairbanks on Thursday, 2/17, with a certified time of 12d 10h 7m. It came not a moment too soon. For over the last 100 miles, Dave was not just battling Mike Ellis for positioning, but a nasty virus as well. “It’s a good thing I caught it at the end of the race or I wouldn’t have survived this race,” croaked a feverish Dalton. Calling it one of the toughest races he ever experienced, Dave later recounted before an enthralled crowd at the Finish Banquet just how dangerous the race had become once the mushers left Dawson, “I’m going ‘geez, how are we going to get out there to forty-mile.” But make it out there he did, along with Jodi Bailey and Mike Ellis. The story of their cooperation is one that’s retold in almost all the stories of the mushers. It’s what makes this race unique. It’s now the last leg of the journey. The Dalton Gang left right on schedule and are headed home at a good pace. They should hit the finish line anytime after 9:00pm. Out of the Two River’s Checkpoint, Dave was the only musher to still have twelve dogs (Jodi Bailey had to drop one.) It looks like Dave and Mike Ellis are battling it out for eighth place, but all three are champions. Indeed, to endure this test of will power and determination takes great intestinal fortitude – guts – and all of the finishers have it in spades. Hail the returning heroes! The Dalton Gang is moving into the final stretch. At a brisk 11 mph, they cruised from Checkpoint 101 to Two Rivers. Now, they stand at the edge of a top ten finish. Now, they run to their goal, the end of the Quest. Running through the night, they checked in at 3:25am with an impressive run time of just over 7 hours. These fantastic athletes these fourteen, now twelve…Nicole – the leader,Zeke, Healy and Denali, Sleepy and Doc, Al, Sam, Tom and Sheldon, Sandy and Panda, deserve our applause for the grit, determination and the muscle they demonstrated. Dave was along for the ride. With each mile that passes, Dave gets that much closer to Frank Turner’s record of 25 Quest runs. He has made his passion his lifestyle and defines what mushing is all about. Dave, along with Jodi Bailey, are the only mushers left with twelve dogs. They take care of their animals. Congratulations to Dallas Seavey, 2011 Yukon Quest Champione and Rookie of the Year! Dave is currently resting in Central after arriving last night at 11pm. He came in slightly behind Jodi Bailey and slightly ahead of Mike Ellis. Again, Dave is in fine spirits and claimed to have no trouble with the overflow that has played havoc with other mushers from the previous day. Estimated time of departure is 6am. Getting closer to the end. DD: See you guys out there. Mike Ellis: Be sure to make a nice trail for me. Jodi Bailey: You told him that yesterday. How’d that work out for you? Yesterday, Valentine’s Day, turned out to be the most exciting of the 2011 race, if not all-time. Favorites scratched and new leaders emerged. It was first and foremost a day of attrition. Early in the day, last year’s champ, Hans Gatt was forced to scratch after developing second-degree frostbite, making it impossible for him to care for his dogs. After battling back from near-hypothermia on American Summit, dealing with high winds and deadly overflow, nature exacted it’s toll. Later in the evening race leader, Hugh Neff, the musher who had led at every checkpoint, met his match on Eagle Summit. Breaking hundreds of miles of trail proved to be too much as Neff, and Dan Kaduce, another front runner were forced to withdraw. Coming into the Two Rivers Checkpoint, Ken Anderson, the new leader, was assessed a time penalty for not checking out properly at the previous checkpoint. As it stands, 13 mushers have scratched since the beginning of the race leaving 14 determined souls left to battle it out. With 87 miles remaining, Dallas Seavey, son of racing legend and former Iditarod champ, Mitch Seavey, is now the new leader and odds on favorite to win. Dave and the gang, hanging back in the eighth position, continue to show their grit and mettle. Arriving in Circle at 9:30pm, Dave was in great shape and fine spirits. The dogs, too, looked healthy and ready to go for more. Since dropping two dogs in Carmacks, the remaining twelve have hung tough and now must gut it out over the most demanding portion of the race. Dave has decided to wait until daylight before tackling Eagle Summit. He knows the hazards he will face and as a grizzled veteran, how to handle them. It may be slow going, but if he finishes, it will be in the money. Our prayers are with him.